Floating in the stable outer orbit of AEC-34; a large class 4 planet, wholly inhospitable to life; was a Sanctuary Pod, the only permanent human-made object in the entire quadrant. Light; after traveling 250 million kilometers from the nearest star, a yellow dwarf; glinted off the black paneling which encased the pod. It was cylindrical, the paneling despite appearing smooth from a distance was actually ribbed and within these ribs was material to transform a small fraction of the reflecting light into electricity. Some of this electricity was used to keep the batteries at full charge, but most of was transformed again into radio waves, which oscillated back out into space so interstellar ships within billions kilometers could detect its existence. The rest of the paneling served to protect it from space debris, and even substantial impacts with larger, faster, and spatial material. Underneath the exterior paneling was a thick layer of insulation and protective material from the cold and radiation of dead space. Underneath that was a mess of different systems all intertwined and squeezed together. Between these was just enough open space, to fit five people with breathing room and ten people standing shoulder to shoulder. The most important systems within the pod were these; batteries that held enough energy to awaken the pod from hibernation, air ventilation, oxygen regeneration, water cycling and regeneration, seven standard months of superpacked food reserves, and the processes to unpack and prepare it. Sanctuary Pods existed in two states; active and sleeping. The sleeping state was designed to last indefinitely, at minimum a few hundred years, at most several thousand years. The active state was designed to last nine months, the working theory being that any pod could be reached from a major spaceport in an emergency within that timeframe. The pods were commonly referred to as ‘mega-engineered’, an indicator of the many years of design and vast investment. The final design produced pods that could be sent to the reaches of space that took years to traverse, places were accidents had caused many casualties. In the years leading up to the design of the Sanctuary Pods, several major research vessels with acclaimed scientist and researchers had experienced debilitating problems great distances from spaceports. Which, despite working communication had led to the; slow; deaths of those on board. In one case the only malfunction with the ship was with the system which would remove food resources from superpacked storage and prepare it for the crew, they were eight months from the nearest spaceport and four months from the nearest space ship; they starved. Space was, in fact, a dangerous frontier, and danger was something that long since been removed from the typical human life. It was different, than when earth was first explored, a time when a ship exploring new reaches of earth held more value in materials than in human life. Which maybe; in a certain manner relative to the time period; that would have been a fair assessment. How could an ordinary citizen react to any such tragedy when it was likely that someone who lived on the same block or worked in the same shop had died suddenly from a myriad of often mysterious causes. And if ordinary citizens don’t react, then governments and societies don’t much care either. Even in the earlier days of space travel, danger was so inherent it was assumed. But once that danger was largely conquered, society seemed to have assumed that space travel would always remain safe. For the first few planets and stars everything worked well, but once humanity tried to open the doors to the rest of the universe, well things changed. Distance became a danger, and although technology had minimized the distance (as perceived by humans traveling it) it was unlikely that the danger could every truly be mitigated. Any technology that minimized human perceived distance, also opened up space farther out into the cosmos. But of course, distance itself wasn’t a danger, rather it was a multiplier of other dangers, no matter how remote. Even the most minor of failures, could easily become fatal. 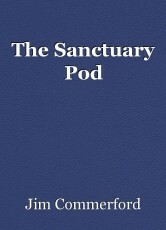 The solution; Sanctuary Pods. Safe places spread throughout the universe, where humans could survive for an extended period until help arrived. The government at the time jumped on the idea, saw it as a way to promote space travel and exploration. Research was done, the idea was proven to be feasible, and the government approved enormous grants to design, build, and launch the pods. Many were blasted deep into the reaches of space, to the places in between destinations, potential future trade route, and likely targets for exploration. The project progressed for a number of years, but then, within a relatively short amount of time, the supporting politics died out and the program was halted. One of the last to be rocketed into deep space bore the serial number 069314, and was destined to enter a stable orbit around AEC-34, where it would exist indefinitely. As one of the last pods, it was sent to farthest reaches of space. At the time wholly unexplored and in the eyes of the humans of the day, was nothing more than a statistical probability of future exploration. The program ended long before it reached its destination. It was forgotten, and quickly became a relic of another era. But, information is often still remembered, even if lost in midst of changing civilization. The Sanctuary Pods location data was bounced around to many organizations, and stored on networks of information unprecedented during its development. In the process the data was lost, forgotten, and rediscovered innumerable times. But, it survived until the pod served its purpose. About two standard travel days out from the Sanctuary Pod with the serial number 069314, a damaged ship drifted. The inside was dark, the forty foot common area was lit only when necessary. The six rooms, located directly off the common area, were black. For the duration of the flight the passengers and crew had kept to themselves, but now, in the dark, they anxiously floated in a loose cluster together, quietly meditating. They looked at the only thing they could see; the stars through the rectangular window which occupied most of the wide common area walls. The crew referred to as the ‘ceiling’. The stars were perceptibly passing across the window at an oblique angle; the ship was silently rotating. Towards the front of the ship was the opening to the pilot’s quarters. Currently it was closed, the faintest shadow of light was barely perceptible through unsealed frame. One of the passengers; Jermaine; watched it intently. He waved his hand in front of his face and saw the light disappear behind it, the darkness was near maddening, but the light felt tangible, at the moment he felt it was keeping him sane. The other five passengers avoided the light, and each in their own way tried to focus on the beauty of the stars. They actively avoided the door, because behind the door the two pilots and two crew members were preparing the ship for a final effort, their only hope. In x days since the accident patterns had begun to emerge from the stars. Their minds had already begun to map their view of the galaxy, and on each rotation they watched constellations that they themselves had named pass. It became a method of timekeeping, it was the only thing in their world was showing such change. While the passengers lost themselves in the stars and Jermaine watched the faint light, the pilot; whose name was Gerre; made one final decision. “We go for it on this rotation” he said. The copilot Jahone, nodded. The other two crew members, Hayue and Danste, stood silently. As much as it was a decision, it was the only true option. Waiting longer only increased the chances that something else could go wrong. The batteries were charged enough to give them a boost and the navigation system had calculated their path. With the captain’s affirmation decision; the only necessary human component; they waited only for the ship’s rotation to become ideal. Compared to take off, the ships remaining power would have appeared nearly useless, but as they floated farther off their intended course, the power relative to the needs of the crew was immense. Great fortune had befallen them, even in the midst of the crisis; AEC-34; with its orbiting Sanctuary Pod; laid in front of them. If the asteroid had struck them after they had passed, the remaining power would have been worthless; totally unable to reverse their direction. It was a concept that most of the passengers hadn’t fully comprehended. Some of them unfamiliar with space travel, hadn’t realized the collision had only minorly altered their trajectory; and had hardly slowed their speed. Watching the stars slowly rotate with the ship gave the feeling that the ship was nearly stationary, when in reality it was anything but. Gerre sat strapped into his seat, his back straight up barely touching the back of the normally soft and comfy chair. Anxiously waiting for the computer to start the thrusters, in his mind he was preparing himself for the worst. At the moment it was not his own mortality that bothered him, but having to explain to the passengers their eventual demise. If the thrusters had suffered any more damage than the sensors had detected, they would never reach the Sanctuary Pod. They would die in the ship, there wouldn’t be the least hope for rescue. Their asteroid had wiped out all of their communication systems. Without which no could find them let along reach them before they had long succumbed. No amount of human survival instinct could save them, it wouldn’t matter whether the last alive resorted to cannibalism, they would still die. He pondered the death sentence, it was unlike a medical diagnosis, where one could still live and enjoy their remainder of their life. Here there was nothing; people sure, but watching everyone around him slowly succumb was hardly a good way to go. So suicide was on his mind, but the methods of which he had none. They were no weapons, and he could think of nothing which could make the job of it any easier. He hoped the thrusters worked, even if it only gave temporary hope. Then as he sat pondering their fate, he realized he had actually forgotten about the passengers. Who were floating in the common area. “Tell the passengers to secure themselves” he said to the two crew members standing behind him. Following his orders they opened the door and pulled themselves through the opening into the common area. Jermaine watched the door open, glimpsing the glow of the control panel and the outline of the pilot. Danste stepped through the door first, “Strap yourselves in” he said. To Jermain this description seemed a much more coarse description than when they had first taken off. When Danste had explained how to securely buckle their seatbelts and remain seated, in an upright position facing forward. Hayue; following him through the door; clarified the situation; “the force won’t be as strong as when we first took off, just be sure you won’t get bounced around”. He pushed off the door frame, gently propelling himself towards the nearest passenger, Trucea. Trucea received his outstretched hands and allowed herself to be propelled towards the edge of the common area. Where she then navigated; towards the ‘floor’; using grips, which had been designed to fit naturally into the interior walls. Upon the reaching the ‘floor’ she pulled herself into the nearest seat and pulled the buckling harness over her shoulders and snapped it into place between her legs. Another passenger; Friedo; landed next to her. They didn’t talk, no one had talked much since the accident. Instead she looked up again at the stars, she thought about her childhood. Memories had been flashing through her mind since the accident four standard days ago. Her childhood has been unusual, almost certainly unlike anyone else on the ship. The house she grew up in was made of wood, not processed lumber, but logs and sticks. The weather was tropical, with no need of insulation the walls only served a barrier from nature. It felt wholly unlike the walls now around here, which protected from a relatively quick; and probably quite painful; space death. Technology; similar to which created the very environment she now breathed in; was unknown to her until she reached her mid-twenties. The community she came from was quite opposed to technological culture. Her parents had gotten swept up into a particularly strong anti-tech movement, which relocated them to a remote planet she grew up calling, Anersia. Anersia had produced vibrant plant and simplistic animal life before being discovered and its atmosphere terraformed to support humans; humans who opposed technology. This community consisted of several thousand people spread over a significant area; although her memory seems fuzzy on the details of distance. But, for practical purposes they lived in groups of ten to twenty, a sort of sub-community usually based around running a farm. Everyone on Anersia subsisted by extensively farming the land. It was hard work, she always remembered her father being busy, and often stressed over whether or not the crop would be successful. In hindsight she had learned that very little of the natural fauna could be used for sustenance, and the soils differed significantly from common earthen type of soils, making planting earthen based crops difficult. In addition the anti-tech leaders, also opposed a monetary system, instead they encouraged sharing among the community. But encouraging sharing did little on a large scale. As it was the society she was born into, she didn’t question it. But eventually; not unlike her parents had questioned technology a generation prior; she questioned the anti-technology lifestyle. At twenty six she left and never returned; usually trying to leave the environment of her upbringing in the past and out of her mind. But now trapped in a space, where looking forward meant looking at the possibility of a slow demise, she wanted to look back. The difference; between then and now; was stark. It didn’t cause her to question or second guess leaving Anersia, but it gave her pause. Pause enough to wonder how far humans had come, in her life she had jumped nearly a thousand years. From a people perpetually struggling with subsistence farming to an intergalactic society, with far reaching technological prowess. And still, death was easy. Often it came to many too young or at the most unfair of times. Technology may have stamped out much of the death early people faced, but it also created new; perhaps interesting and certainly unfortunate; ways for humans to die. She didn’t want to die, and so she tried to stay away from thoughts of death, and by extension, as far as possible from the current situation. She had floated; and now sat; rigidly, with her arms folded, legs crossed, and unmoving. It was meditative. Out of all the memories that her mind had been recalling, one in particular had looped through her mind most. It was short, simple, and vague in the way that one’s earliest memories always are. Her father had been; by necessity; a strong man. When she was maybe three or four years old, things must have been going well on the farm. Because her father took her on a vacation, that in her memory lasted for weeks, but couldn’t have been more than two or three days at the most. The two of them went camping, probably not far from home, but of course it felt far from home. What she remembered was; riding on top of her father’s powerful shoulders, and feeling such a sense of adventure. As if they were going to a secret spot only they knew of. That was it, the memory had hardly any material content. But she had carried that feeling of adventure with her for the rest of her life. Right up until the accident, she felt confident and excited to find and experience a new place. But now, she missed her father’s powerful shoulders which carried a feeling that everything would be all right and a belief that he could protect her. Feelings of protection now gone and uncertainty ahead, she tightly gripped the restraints around her chest. Friedo, who was sitting next to her, was; unknown to them both; gripping his restraints in the exact same manner. His reasons were different though, his mind wasn’t using the past to comfort in. It remained firmly locked onto the future. Well… one possible avenue the future could take, the one where they didn’t all die together in space. The captain, had yet to really inform the passengers about the possible outcomes of their situation. And so it was somewhat unknown; even though he should’ve understood by now; that this ship would never reach their destination; a planet called Uero. In part it may have been due to his prevailing anxiety about reaching Uero, which had plagued him long before stepping onto the ship. In Uero, waited a girl… he hoped. Her name was Jasmina, they had become acquainted nearly two standard years earlier. It had been a relatively short; but extremely eventful; three months together, at which point her job required her to relocate to Uero. Her profession was marketing, and the company she worked for had acquired a lucrative contract through the Interplanetary Union (IU) with the young Government of Uero (GU). Currently, she was the head of Uero’s marketing department. As soon as she had decided to leave for Uero, she encouraged him to join her. He had agreed, and had immediately begun making plans. But, then is anxiety about the move began to set in. It held him back and allowed doubt to flood his mind. Was she worth totally changing his life for? Would he find good employment there? Uero’s civilization was young, it had first been settled only thirty years prior. It became official Planetary Member of the IU only ten years earlier and its total population was only thirty thousand. Which, despite showing impressive growth over the last ten years, was still a tiny self-sustaining civilization. Trade routes; like the one he was quite near; had naturally appeared, but were still rarely traveled even by cosmic standards. Which was why precisely why their present situation was so dire. Eventually he made up his mind, not by convincing himself of one option. But by leaving his job and making arrangements to move to Uero. One of the many; but definitely one of the greatest; reasons he was anxious was his inability to contact her. The civilization on Uero was irregularly young amongst all settled planets, and as such had yet to install a full communication network to the inner planets. The communications currently set up were primarily reserved for communicating with the IU, and reserved for emergencies. Normal citizens of the planet could still send data back to the systems of the inner planets, but it required physical transport aboard a ship. In fact, since migration to Uero had nearly ceased in the past ten years, ships like the one they were aboard were more profitable on the return trip, while carrying data back to the inner planets. After data was physically delivered either too or from Uero, it could be downloaded into the relevant system and from there forwarded to the intended recipient. It was a relatively common mode of data transfer among large companies moving larger amounts of data from planet to planet. Albeit being quite irregular as a primary mode of communication. Still, he could’ve; and should’ve; written and sent a message to her. Plenty of companies existed that would have happily handled the data transfer within a year. But, that time gap made it difficult to fully commit to any particular message. Also, she had not send him any sort of message, which nudged into his thoughts from time to time. In the end maybe it wouldn’t matter, at two years it was debatable whether either of them would have been able to return the initial message before he stepped onto the ship. But, maybe if he had sent message he would feel slightly less anxious about showing up unexpected. And of course, in some manner the continuation of this anxiety post-accident was nothing more than a coping mechanism. Something he willing allowed to fill his mind, because the alternative was even worse. All the passengers were now strapped in, Danste and Haye took their seats among the passengers and strapped in. They waited. Gerre and Jahone had strapped into their seats too. They also waited. The systems computer continued silently calculating the ships trajectory and the Sanctuary Pods location thousands of times per second. Each time it was a little closer to ideal, until then; it waited to fire the remaining engines. Then, finally a moderate humming noise entered the ears of all those on board. Their bodies are pushed gently back into their seats. Most closed their eyes, but Jermain leaves his open and staring at the solitary cabin door. The captain’s eyes are also still open and receive a constant flow of information from the multiple displays of the systems computer. But the most telling information is not amongst the numbers and graphs the system is outputting, but the force his body feels as he is pushed him back into his seat. They accelerating, which is quite good. No one talks and for the first time since the accident the atmosphere could be described as peaceful. Over the next several hours they continue to feel the constant acceleration. In addition what they don’t feel; as it is imperceptible; is the obliqueness of the force, a resultant of the ship altering its trajectory. The captain knows this, because it is output to one of the screens in front of him. This is a good sign. Without warning it stops, the humming and acceleration both cease. A nearly visible wave of confusion and something like desperation passes through the passengers. But, quite shortly thereafter the captain steps through the door and gives a big thumbs up. It is a universally mood boosting gesture. “We are on track for the Sanctuary Pod” he says. “We’re not out of the woods yet, but she hasn’t kicked us into the fire either” he says mixing old metaphors likely unfamiliar to some of the passengers. But the message is received the same regardless. A sort of silent applause percolates the group easing out some of the tension which they had finally adjusted too. The captain stands in the front for another thirty seconds or so, awkwardly receiving the aforementioned applause. Then without speaking he turns back and enters the cabin. But a moment later he reappears adding “The systems computer says we should reach the sanctuary pod in five days, fourteen hours, and” he glances back inside “eight minutes, twenty two seconds”. The systems computer within the Sanctuary Pod was not sentient. But, if the pod had been constructed around two hundred years later during the right fifteen year timeframe; when humans were making every conceivable thing intelligent; it likely would have been a least partially autonomous. If that had happened, then it would be easy to imagine the computer experiencing the most glorious, all-powerful, and maybe even extreme orgasmic feelings as it extended its docking bay. Then that feeling increasing as it was quickly filled by human who required it for survival, full filling its intended purpose. All of its long dormant systems sprang instantaneously into life and flooded the cabin with life sustaining atmosphere. All its environment sensors began collecting data, which was then processed, analyzed, and compared against normal ranges for humans. And everything is working, cabin pressure is good, air content is good, mechanical systems are ready, food stores are ready to be unpacked. It sensed humans in the docking bay, through its motion and sound wave detectors. And, although the system lacked sentience or a method of separating speech from other noise, if it did it would have heard. Silence, no one was speaking yet. A sound the group had grown accustomed too. Breaking of which was actually somewhat difficult, the first to speak had to say something significant to mark the momentous significance stepping into the Sanctuary Pod; that they weren’t going to die. Fortunately in most groups there is one person a little bit less bound of social significance or stigmas. In this group, the captain; Gerre; filled the role “I can’t believe we’re actually here. I really thought I’d have to explain the inevitability of our deaths to you.” He said, with genuine cheer in his voice. “Thankfully it didn’t come to that” Jermain responded flatly. It was the first thing he had said aloud since the accident. They stepped single file into the small; but to people in their situation, inherently cozy; room of the pod. The walls were black and had a smooth but grainy texture. Lights were set into the ceiling in rows and although they appeared dim if one looked directly at one, they actually illuminated the area well. The only other thing of immediate note, was the screen centered on the wall opposite from their entry. It glowed and was filled with images and what appeared to be words. Upon closer inspection (over the next few hours, days, months etc.) they discovered the computer had a large number of present languages. The one it was currently defaulted too was Standard Intergalactic, which was known by all onboard. Except, that this version of the language was old. Some of the words seemed archaic to the group, a couple were unfamiliar, and others were normal. For the most part they could grasp enough meaning combined with the simple images to navigate the system and access its many functions. The first function they discovered was how to lower the beds. After navigating a couple of reasonable well designed menus they were able to lower the beds from the ceiling. Seemingly materializing out of nowhere. They quickly learned that the system had sensors built in, which prevented them from lowering on people. And through a little trial and error were able to arrange themselves so each row beds would lower from the ceiling until they filled the entire room. This created an interesting sight for the group, a room filled wall to wall with double layered beds. Shortly thereafter they figured how to control and dim the lights. And shortly after that most of them were asleep, and those that weren’t felt comfortable and peaceful. Gerre, sat on the edge of his bed looking at the display screen. It gave off a gentle glow, one that Jermaine two beds over found comforting as his eyes slipped closed. On it was a small repeating animated icon that had appeared after he tapped through a couple of menus. Even though it old and archaic, he got the message. A signal was being transmitted out into space. He knew that it was likely only through radio waves, and therefore would take some time to reach their intended destinations. But it was out there, and they were alive. Their immediate survival was secured, he thought. It was the first time in his entire life anything remotely similar to that theme had occurred. Survival, such a basic aspect of life, but one which the modern human had almost no awareness of. As he laid down on his mattress, his thoughts aimless for the first time since the incident, he realized how fragile everything was. Not just life itself, but nearly everything that held modern society together. All one saw was precariously balanced upon a hidden wedge. All it took was a little push or a little weight off balance to lose equilibrium. That was how an asteroid that had moved throughout the cosmos for millennia without incident could strike you. Mess up your day, alter your course, and put your life in jeopardy; if it didn’t kill you outright. It was simple, and totally out of his or anyone’s control. That was inherent to life. Maybe, that was the entirety of life, always being bounced around by unforeseen forces dictating means of survival. If so, it wasn’t irregular, just unseen, unknown, unfelt. Hardly anyone; who wasn’t terminally ill, would even consider that the present day could spell the end. But, the truth was it could, and by nature one day it would. © Copyright 2019 Jim Commerford. All rights reserved.